Scottish Dream Tours: Tea, Glorious Tea! Only 2 more days and I am off to Ireland! I am so excited and I can't wait to get to Bunratty and have a nice cuppa! Having had a tearoom for so long and also making my own blends of tea for many years has aroused quite a curiosity for tea and all things tea. We always think of tea as being very British, and this is ri...ghtfully so, as they have done more with tea than anywhere else in the world, but Britain actually came quite late to tea. 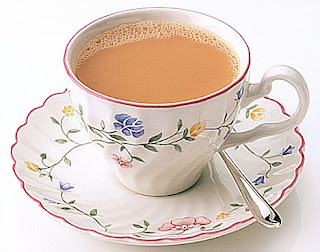 The British Isles of course does have the distinction of drinking more tea than anywhere else in the world. The British Isles is made up of Scotland, Wales, Northern Ireland and England. Ireland is a Republic all unto itself, and having worked so hard to get there, they do not like to be included in this category. You will notice that in my posts I always say, The British Isles and Ireland. For clarity we will call Scotland, Wales, Northern Ireland and England the United Kingdom as that is the appropriate title. This land grouping is small enough to fit into the state of Michigan, and yet they drink almost 200,000,000 cups tea daily, for every day of the year! Ireland, however, holds the distinction of drinking more tea than any other country in the world. They average 7 cups of tea per person per day! I have never been anywhere in Ireland where the first thing that is done after greeting you, is putting the kettle on for tea. What a wonderful way to welcome someone to your home! The Irish are not particularly fond of flavored teas or herbal infusions. Irish Breakfast Tea is primarily Ceylon tea, which is a very small, dark tea leaf and produces a very dark cup of tea which much more resembles coffee. And the Irish want their tea strong! In both Ireland and the United Kinggom almost all tea is served with milk but much fewer take sugar, only about 30 percent. You generally want to use milk and not cream, as cream masks the taste and milk enhances it. I started blending tea about 10 years ago, and although there is no possible way that I could be labeled as a master, I have learned a tremendous amount about tea. I started blending tea for my tearoom and wanted blends that would reflect the areas of the British Isles and Ireland that I love so much. My very first blend I called "Wildflower Cottage", which was the name of our tearoom. It is a black tea blend of wild blackberry, rose, jamine and vanilla. The second blend is called "Queens View" after my very favorite view in the Perthshire area of Scotland. It is an assam blend with huckleberries and butterscotch. It took quite a while for my "Isle of Skye" blend to come about, but in the process I came up with a few more blends. I have "Irish Morning", which is a ceylon tea blend with raspberries, cream and grenadine. "Yorkshire Dales", which is a darjeeling with pear, caramel and cardamom. "Mystic Glen", which is an assam with rhubarb and ginger. "Pembrokeshire Peach", which is black tea blend with peach, apricot and ginger. "Strawberries and Cream", which is funnily enough, strawberries and cream!And finally "Isle of Skye" came together. I wanted it to have an earthy taste and remind me of our ancestral homein Scotland. It eventually turned out as an assam with apples, cinnamon and vanilla! I drink tea on a daily basis and I am always thrilled when magazines and newspapers come out with "new" ways that tea can be beneficial to you! Things tea blenders have know for years. Tomorrow I wil talk a little more about the origins of tea, its course from China into the Western World, the differing teas, tea leaves, and where they come from. When I first get to Ireland however, I will raise my first cuppa to all my wonderful readers, who I will be thinking of fondly!